CHAPEL HILL, N.C. Sporting Alert — No. 20 Duke used a late rally to upset No. 5 North Carolina 74-73 in a key Atlantic Coast Conference game in Chapel Hill on Wednesday night. 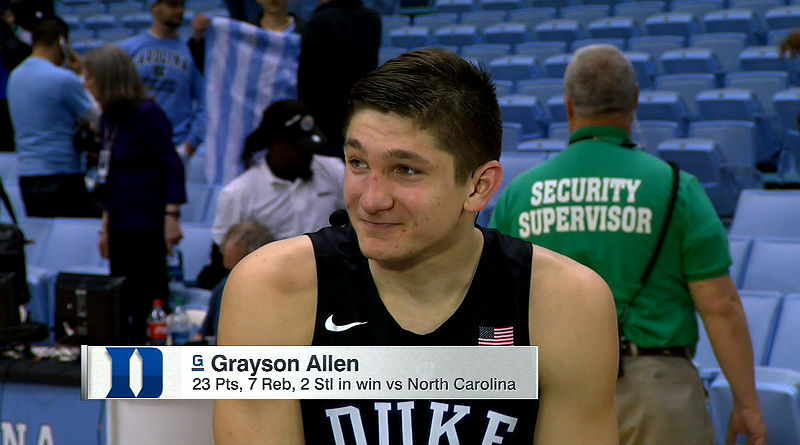 Sophomore guard Grayson Allen scored 23 points and grabbed seven rebounds and freshman guard Brandon Ingram added 20 points, 10 rebounds, four assists and two blocks for the Blue Devils (20-6, 9-4 ACC), who trailed for much of the game. “These kids have gotten so close,” Duke coach Mike Krzyzewski said. “They’ve done an incredible job. Luke Kennard finished with 15 points and Marshall Plumlee collected 11 points and seven rebounds for Duke, which played most of the game without senior guard Matt Jones after he injured his left ankle early in the game. Freshman Derryck Thornton also came up with a key block shot on the final play of the game to help secure the win for the travelers who have now won 11 of the last 14 meetings against the Tar Heels. Brice Johnson paced North Carolina with a double-double of 29 points and 19 rebounds, while Justin Jackson added 13 points, eight rebounds and three assists for the Tar Heels (21-5, 10-3), who dropped to second place in the ACC standings. With the win, Duke collected its fifth victory in a row, including three successive against AP top 25 ranked teams. The Blue Devils trailed 60-53 with 11:47 remaining in the second half, but cut the deficit to four points with just under eight-minutes remaining. The defending champions then trimmed the gap to 70-69 with 4:19 left before Allen knocked down two free throws to give Duke the lead with 1:09 remaining. Thornton then made a vital block on Joel Berry II and the travelers collected the stop they needed to leave Chapel Hill with another win. Preseason ACC co-player of the year Marcus Paige struggled to get going all night with the senior forward scoring just seven points on 2-of-10 shooting. He also missed all six of his attempts from 3-point range in the defeat for North Carolina. Struggling on the night as well was sophomore guard Berry II, who went just 2-of-12 from the floor for eight points. Tar Heels coach Roy Williams shouldered the blame for the defeat, stating that he should have called timeout in the closing seconds of the game to setup a better shot on the last play. He revealed that he apologized to his players afterwards. “I told them I was sorry, that I should’ve gotten us a better shot at the end,” Williams said. North Carolina dominate the rebounding column, 46-34, but was ice-cold from long range after going just 1-of-13 from 3-pointers. Both teams are off until Saturday when Duke travels to No. 18 Louisville and the Tar Heels play hosts to No. 11 Miami.